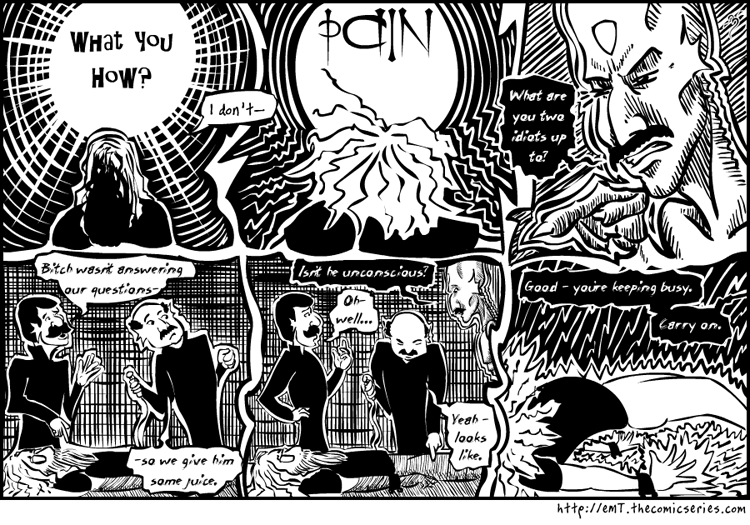 You know, though it may not seem like it, there's actually a whole lot of groundwork laid out in this strip. I'm amazed at what you come up with on your schedule. That looks like an alien Frank Zappa. It's like looking at the surface of the ocean. I can see that it's massive, and that's just the surface. Yet I can't quite see down far enough to stifle my curiosity about what lies beneath that glassy, polished surface. That is the experience I have when I think about the storyline of your comic. Attempt #3. If the system eats them this time, i may leave the comments on this strip unreplied. Unk - Major turmoil coming up on the prime material - we'll see if i can keep it up as things happen. I may have to cut back on publication frequency for a while. Like i said - we'll see. RT - It's oddly funny how often characters in the comic come out looking like someone who roams in my head without me realizing it while i'm drawing them. MO - you and our hero, both. Arden - Or maybe um-learn him with that electro-shock stuff? Jack - At this stage, i'm just glad that folks can perceive that there is indeed something down there. But that reminds me to caution readers for what i thought was happening now. Sometime in the near future, we'll be moving to new servers. When that happens, the comic will be unreachable until the new server address propagates through the DNS networks. Don't panic - it's just a system upgrade and we're not going anywhere.